Ayurveda, a traditional Hindu healing system, identifies three doshas that give insight into people's health and which foods best suit them. The doshas are vata, pitta and kapha. Everyone's body has all three doshas, but you also have a dominant dosha type. A diet that suits your dosha type can improve your mental and physical health and even reduce cravings, according to "Yoga Journal." Ayurveda is based on traditional medicine that many health-care practitioners are unfamiliar with. But you should still consult your physician before dramatically altering your diet. 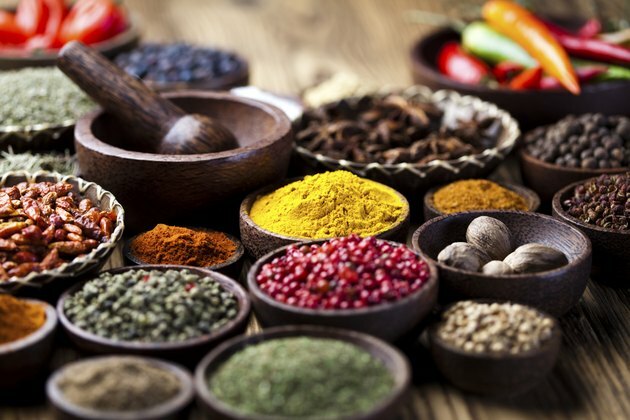 Ayurveda has been used for over 5,000 years as a system of natural healing. The word "ayurveda" translates literally as "the science of life." It is designed to help each individual reach her body's full health potential by balancing the elements, or doshas. The three primary energies and doshas in ayurveda are wind, the vata dosha; fire, the pitta dosha; and earth, the kapha dosha. According to ayurvedic philosophies, your unique combination of these doshas determines your physical, mental and spiritual needs. Most people have one or two dominant dosha types. Individuals with vata dominant generally have a slight build and dry skin; prefer warm, moist climates; are emotionally sensitive; and are naturally creative. Those with pitta dominant usually have a medium build and fair skin; prefer cold climates; are irritable; and are hard-working. People with kapha dominant typically have a heavy build and oily skin; prefer warm, dry climates; are easy-going; and are stable. If you are a pitta-vata type, you identify heavily with both the pitta and vata descriptions. Fruits, legumes, egg whites, lean meats, rice, wheat, nuts, seeds, moderate amounts of dairy, and mild spices like cumin, ginger, fennel, cloves and mustard are recommended for both pitta and vata types. In addition, significant amounts of boiled and steamed vegetables are recommended for balancing both doshas. Unsweetened teas including chamomile, fennel, ginger and licorice are ideal pitta-vata beverages when you're not drinking water or milk. Avoid alcohol, coffee and spicy, bitter or astringent foods to prevent unbalancing your pitta or vata doshas. A day on a pitta-vata diet could begin with an egg-white scramble with arugula and chicken breast mixed in and seasoned with grated ginger and a sprinkling of ground black pepper. For lunch, you could have a cabbage salad with tomatoes, bean sprouts, cauliflower and turkey breast, seasoned with cumin, dill and basil. The day could end with a large bowl of rice and lentils seasoned with olive oil, black pepper, lime and fennel. For dessert, have a fruit salad with mixed berries, grapes, chopped mango and pomegranate seeds sweetened with a bit of honey. Throughout the day, you can snack on nuts, seeds and fruits between meals. Have a cup of herbal tea with at least one meal per day and drink plenty of water. How Can You Gain Weight With Ayurvedic Medicine?